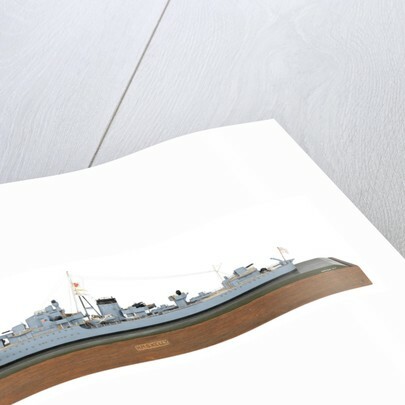 HMS 'Kelly' (1938) posters & prints by H. M. W.
Scale: 1:192. 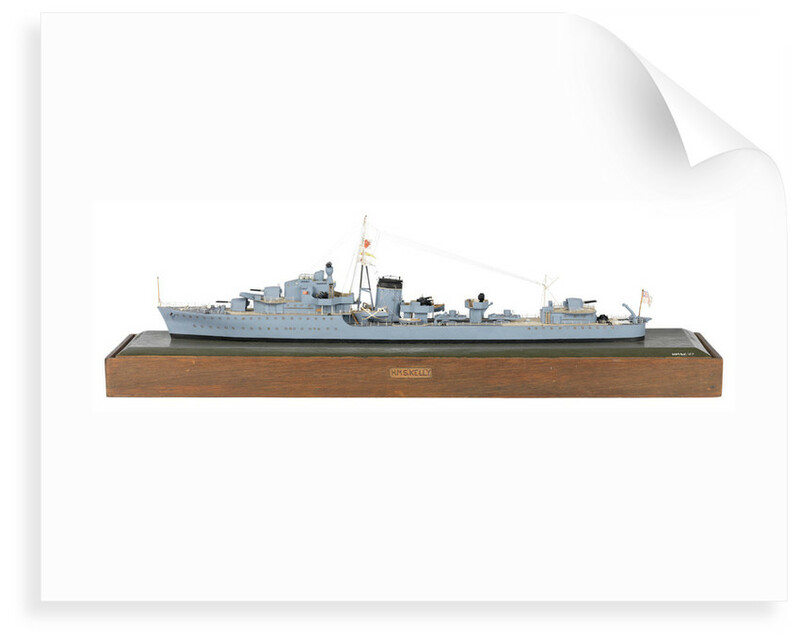 A waterline model of the flotilla leader (K-class) destroyer HMS 'Kelly' (1938) made entirely in wood with metal and organic material fittings and painted in realistic colours. The hull is painted black at the waterline and grey above. Hull features include a long foredeck, long main deck that extends to the stern and intermittent portholes on two decks. All main superstructure fittings are painted grey identical to the hull. Fittings include forward gun turret with two guns; superstructure on the foredeck with bridge, gun turret and anti-aircraft armament atop; single lozenge-shaped funnel; tripod mast forward of the funnel and radio mast aft; gun turret on an elevated platform aft; and white ensign flying from the stern. 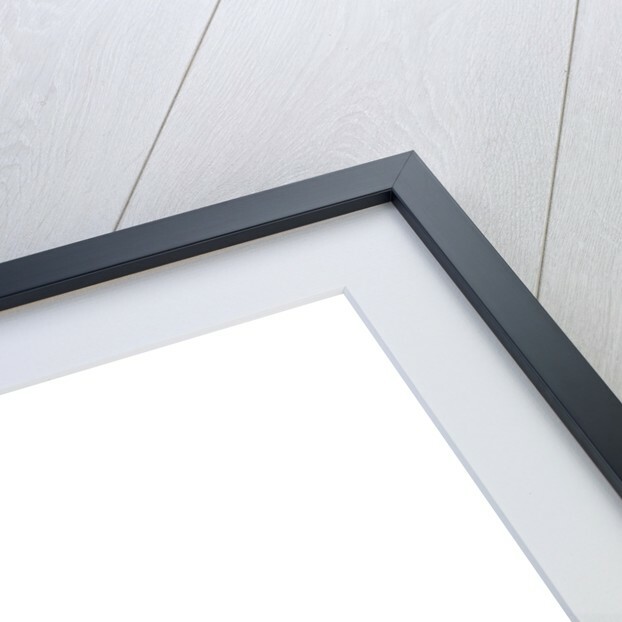 The model is mounted onto a green-painted baseboard with diagonally-sloping edges and displayed in a glazed wooden table-top display case. 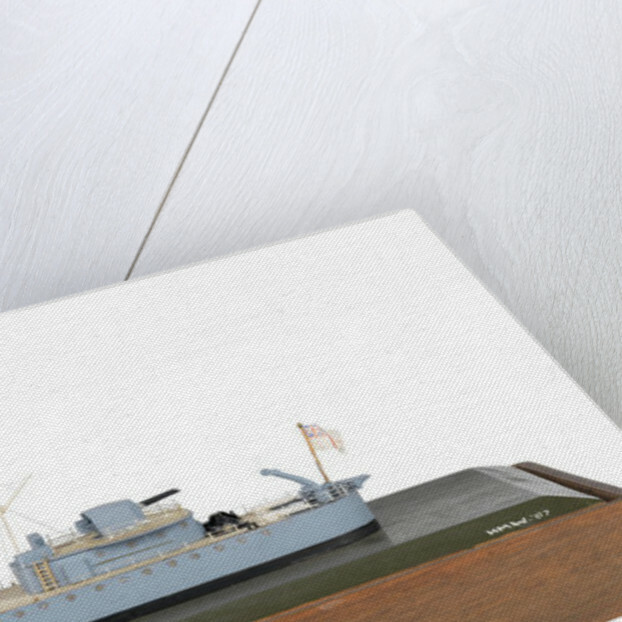 On baseboard 'Kelly' and 'H.M.W.57'. National Maritime Museum, Greenwich, London. We regret that Museum enquiries have not been able to identify the copyright holder and would welcome any information that would help us update our records. Please contact the Picture Library. More by the artist H. M. W..